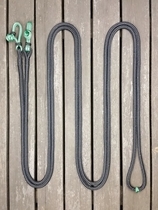 These long loop reins consist of one whole length of rope with connectors in both ends. 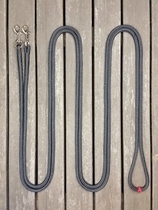 They come in many different lengths to suit horses of all sizes and a wide range of uses such as driving, ground driving and long rein work. 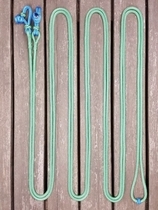 You can also choose how thick you want your reins to be, either 6 or 10 mm (1/4 or 3/8 inch). 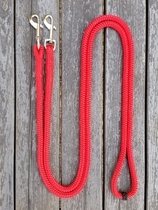 14 mm (9/16 inch) rope can be a bit too heavy for long reins so I have decided not to offer that as a standard option but if you really want long reins made of 14 mm rope I can of course custom-make such reins for you. You have 3 different attachment options to choose from, with or without metal parts, so take a look below to see all of the available options.